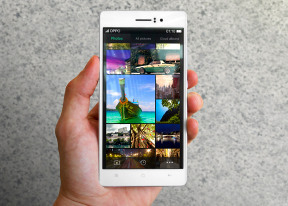 The Oppo R5 has a 5.2" AMOLED screen of 1080p resolution and 423ppi. It uses a similar panel as the Galaxy S5 - at least in terms of visual qualities. It's bright, with even backlighting, low reflectivity and great contrast. Another underlying similarity is the PenTile matrix with a diamond arrangement. The diamond layout will make sure there are no visible artifacts and, with pixel density north of 400ppi, you can't take away any points for sharpness either. The color rendering is great, with punchy colors typical of AMOLED screens. There are no dedicated color saturation modes as on the Galaxy flagships. 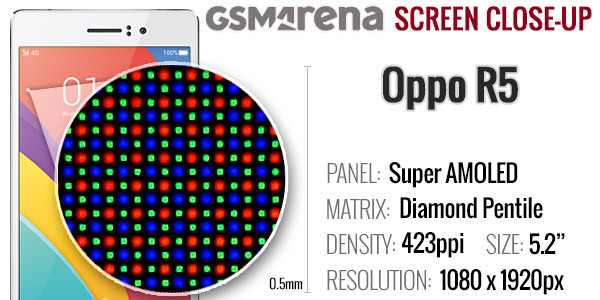 The screen brightness is among the best we've seen on an AMOLED screen both at 50% and maximum. It's even on par with some of the latest IPS flagship screen, which is great. Since it's an AMOLED display, the stellar contrast should hardly surprise. The sunlight legibility is amazing too, helped by the non-reflective screen. 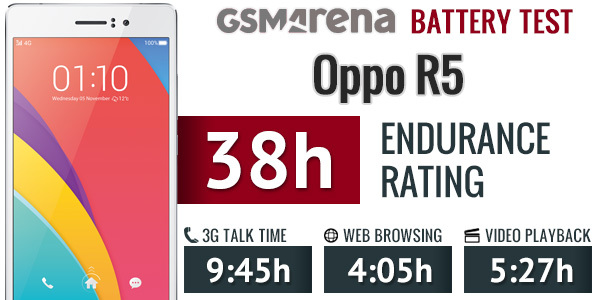 The Oppo R5 is powered by a 2,000mAh battery, quite similar to that of the Gionee Elife S5.1. Unfortunately, the Oppo R5 couldn't match the performance of the ex-record holder and its battery rating is at the bottom of our all-time chart. The R5 posted average battery endurance while on 3G calls, but it did very poorly in web browsing and video playback. While its overall standby performance is slightly above average, it didn't help the Oppo R5 achieve a satisfactory overall endurance rating. The Oppo R5 comes jam-packed with connectivity features. It has quad-band GSM, penta-band HSPA and LTE Cat.4 support, backed by support for a wide array of network bands. There's also dual-band Wi-Fi a/b/g/n, DLNA and Wi-Fi Direct, Bluetooth 4.0, and a microUSB 2.0 port. There is no USB On-the-go support. There is no NFC support though. As we mentioned already, the microUSB port outputs audio via the provided adapter since the Oppo R5 doesn't come with a 3.5mm jack. There is no FM radio onboard the Oppo R5. Global positioning is available - the phone comes with support for GPS and GLONASS. One useful app here is the System update app, which helps you update the phone's software over the air or from a local file (a ZIP saved in the internal memory). The latter is one of the easiest software upgrade utilities we've seen.